The DRI-LPO Series are DIN rail mount, DC input, single or dual channel, isolating two-wire transmitters. 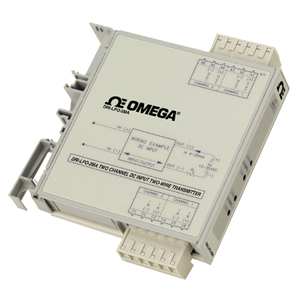 Each channel accepts a DC voltage or current input and provides an isolated 4 to 20 mA output. Each channel is fully isolated (1800 Vdc) from input-to-output and channel-to-channel. All DRI-LPO Series modules feature plug-in screw terminals for easy installation and low Mean-Time-To- Repair (MTTR). Two or more modules can slide together and interlock for solid, high density mounting. This is accomplished by removing either the foot, or the adjacent unit’s faceplate (for right-hand side or left-hand side mounting, respectively). The module to be attached will easily slide on to the side of the mounted unit. DC input, two-wire transmitters are used to isolate and convert a DC voltage or current into a proportional 4 to 20 mA signal. Two-wire transmitters are primarily used in remote locations near the sensor since they reduce the probability of signal errors and save wiring costs by utilizing the two power wires to send the 4 to 20 mA signal. The current signal is usually monitored by a control system or displayed for an operator. Typically, DC voltages or currents from various field instruments (e.g. level, flow, pressure and position sensors) are used to monitor and control a manufacturing process. Voltage signals can only run a short distance to a panel without errors caused by noise or lead resistance in the wires. These sensor (voltage) signal wires are usually terminated at the two-wire transmitter and converted into a 4 to 20 mA signal which is highly immune to noise and not affected by lead resistance, both of which can cause significant errors in voltage signals transmitted over long distances. The 1800 Vdc isolation capability of the DRI-LPO Series prevents ground loops from causing errors in DC voltage or current signals and can reduce susceptibility to radio frequency interference (RFI). Isolation also provides protection from high voltages and current spikes which can damage expensive supervisory control and data acquisition (SCADA) equipment, such as a PLC or DCS. The DRI-LPO Series operates as a two-wire transmitter; each channel derives its power from a 12 to 35 Vdc source connected in series with the 4 to 20 mA output loop. Typically a 24 Vdc source is used for power, allowing 12 Vdc (600 Ω @ 20 mA) for other devices connected in series in the current loop. The outputs of the DRI-LPO Series are isolated from the inputs and protected from reverse polarity. Zero and span pots are provided for each channel to calibrate the output to the input source (±5%). Standard input ranges are calibrated to rated accuracy. One range per module; one or two channels per module.